When the holidays roll around, you may start to think of ways you can give back to your customers to show your appreciation for their support and loyalty. While it’s always nice to send them gifts, it’s also a great idea to step back and look at the best gift that you can give them now and throughout the year–excellent customer service. 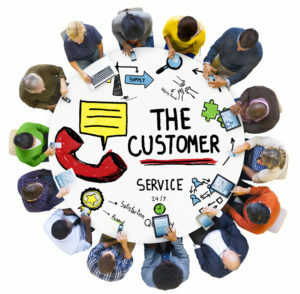 Here’s how to give the ‘gift’ of awesome customer service. The holiday season is stressful enough for your customers. The last thing they need or want is to be kept waiting on hold to speak to someone at your company. For many businesses, call volume increases throughout the holiday season, so make sure you have enough customer service staff on hand to handle all calls promptly. Avoid using impersonal, lifeless automated telephone services. These tend to be frustrating and could put your customers in a ‘grinch’ mood by the time they actually reach a customer service representative. Consider utilizing extra staff during this busy season, or consider using the services of a call centre to handle the overflow calls. Not only will having more hands on deck relieve your customers’ stress, it will help keep your customer service staff less stressed, too. You may be answering your fiftieth call of the day, but that particular customer is probably talking to you for the first time. Try to make the experience a good one, especially if they’ve been waiting to get through or if their problem seems very big to them. It’s important to try and put yourself in your customer’s shoes and treat them how you would want to be treated. This is great customer service advice for every day of the year, so put this tip into action whenever you can! Especially during the holiday season, when everyone is stressed and tired, try to go the ‘extra mile’ when dealing with customers. Offer a smile, a discount, or just listen to their complaints about their holiday stresses. Then, resolve their customer service issue as fully and as quickly as possible. Your customer will definitely appreciate it! For more great tips on providing amazing customer service, check back with Answer 365 regularly!